We are pleased to announce the release of an updated version of the ExDet tool. More functionality for checking the integrity of the covariate layers has been our primary focus in this revision, with the inclusion of the 'Data Checker' feature. Please read the ExDet changelog for further details on other changes. We are pleased to announce the release of the CliMond V1.2 data products. The new Bioclim variables, Bio36 to Bio40 are now included. Please read the CliMond changelog for further details. A new manuscript recently published in Methods in Ecology and Evolution describes five new Bioclim variables. Bio36 to 40, derived from a principal components analysis of the first 35 Bioclim variables, have been added to the Bioclim register. Referring to each Bioclim variable by its Bio number has become a standard reference in the literature. Previously, the ANUCLIM manual was a de facto repository for the variables, containing descriptions. A new manuscript proposes that the CliMond website take over the repository role, describing each variable, and where suitable, making a copy of the variable available within the CliMond archive. We encourage researchers to identify additional Bioclimatic covariates to extend the suite further. 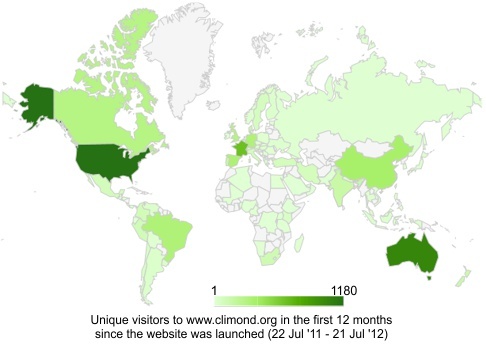 In the third year of the CliMond website, we have had over 21000 page views, this year being from over 4500 unique visits from more than 100 countries. The United States, Australia, Germany and Brazil remained the top countries of origin for site visitors. There was a 112% increase in visits from Argentina and a 75% increase in visits from Chile, leading a strong pulse of activity in South American countries over the past 12 months. We now have over 1350 registered users and these registered users have downloaded over 2400 climate data files in the past 12 months. The journal article describing the creation of the data products has now been cited 84 times. 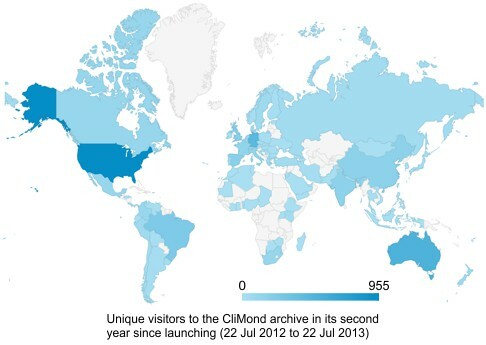 In the second year of the CliMond website, we had over 21000 page views from over 4800 unique visitors from more than 90 countries. The United States, Australia, Germany and Brazil were the top countries of origin for site visitors. We now have over 940 registered users and these registered users have downloaded over 2300 climate data files in the past 12 months. The journal article describing the creation of the data products was the 9th most downloaded paper in 2012 for Methods in Ecology and Evolution and has now been cited 39 times. The CliMond manuscript has been published in Volume 3, Issue 1 of the journal Methods in Ecology and Evolution on pages 53-64. As this is part of the first issue of 2012, the paper is free to download! To download the paper, please click here. 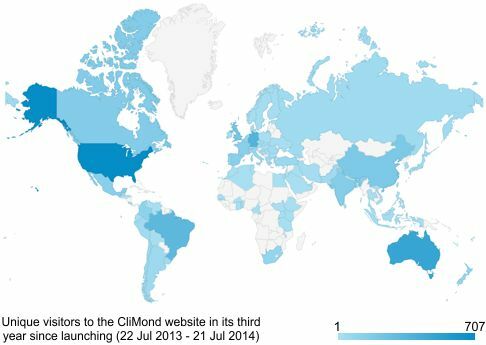 We are pleased to announce the release of the CliMond V1.1 data products. Further future climate scenarios (2090 and 2100) as well as minor adjustments to other data products have been made. Please read the CliMond changelog for further details. In collaboration with Borntraeger Science Publishers, we are delighted to be able to make available a PDF of the original manuscript in which Wladimir Köppen (Graz, Austria) and Rudolf Geiger (Munich, Germany) published their climate classification scheme. Entitled "The Geographic System of Climates", the PDF is Volume 1 Part C in the Handbuch der Klimatologie, a 5 volume series published between 1930 and 1938. In this work published in 1936, Köppen devises the climate classification that is later to be known as the Köppen-Geiger system of climate classification. Download the PDF from the resources page. To coincide with the ‘online early’ publication of the CliMond manuscript at Methods in Ecology and Evolution, the associated CliMond website went live today. 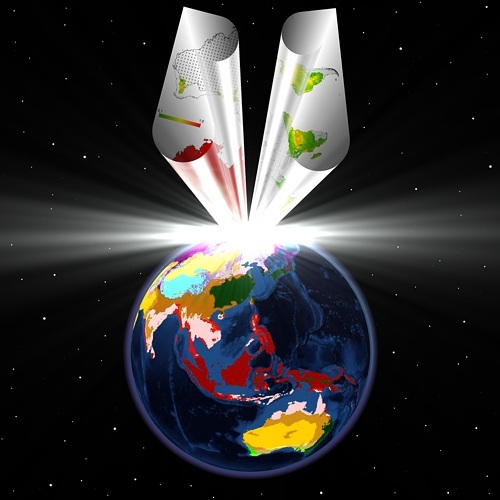 The manuscript describing the creation and generation of the CliMond V1.0 climate data base was accepted for publication by Methods in Ecology and Evolution.